March 31, 2015, 2:31 p.m.
Last week the Supreme Court heard evidence about whether or not the state of Texas&apos; refusal to allow Confederate flags on license plates represents a violation of constitutional rights. Texas is one of a number of states that allows its residents to pay for specialty license plates. The &apos;Sons of Confederate Veterans&apos; is suing the state after it rejected a plate design which included the Confederate flag. Overall, 40% of Americans approve of southern states allowing people to get Confederate flags on their license plates while 39% of Americans disapprove of it. Approval for allowing Confederate flags on plates is highest in the west (49%), where disapproval is also lowest (36%). 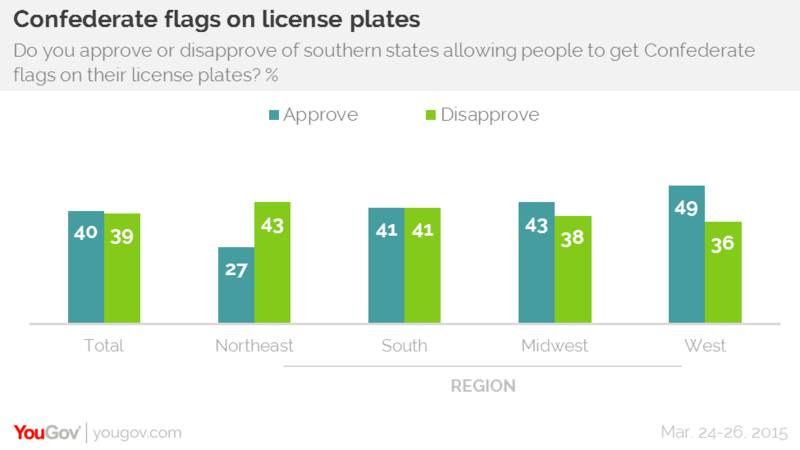 In the south itself opinion is evenly split 41%-41%, while people in the northeast are much more likely to disapprove (43%) rather than approve (27%) of allowing Confederate flags on license plates in the south. There is also a significant partisan split on the issue, with 60% of Republicans approving of southern states allowing Confederate flags on license plates and 57% of Democrats disapproving. Partisan differences are even greater when it comes to the question of whether or not the Confederate flag is a symbol of southern pride or of racism. Overall, Americans tend to say that it is a symbol of southern pride (41%) rather than racism (31%) but among Democrats 50% say it is a symbol of racism while 28% say it symbolizes southern pride. 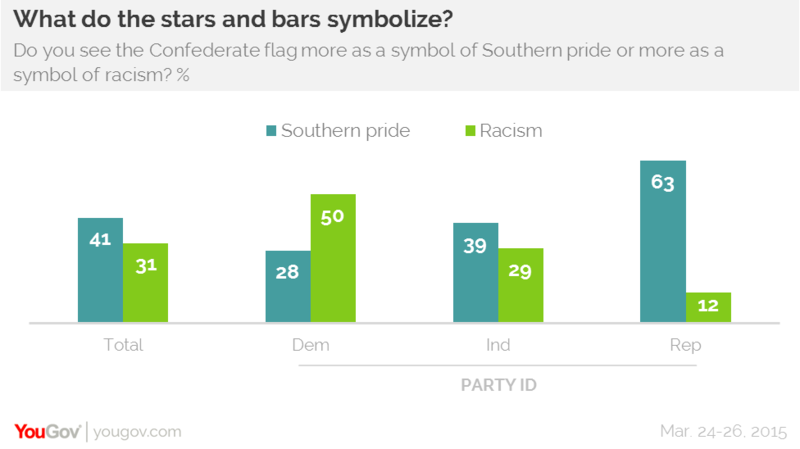 Among Republicans 63% see it as symbol of pride in the south while only 12% see it more as a symbol of racism. Regionally, people in the Northeast are the only ones who tend to see the Confederate flag more as a symbol of racism (32%) than as a symbol of southern pride (28%). People in the south itself as the second least likely (41%) to see it as a symbol of southern pride, as 44% of midwesterners and 48% of westerners saying it&apos;s a symbol of pride not racism.